A photograph of an abandoned Iraqi military column with the Ramadi Teaching Hospital, which is just across the Euphrates River, in sight. 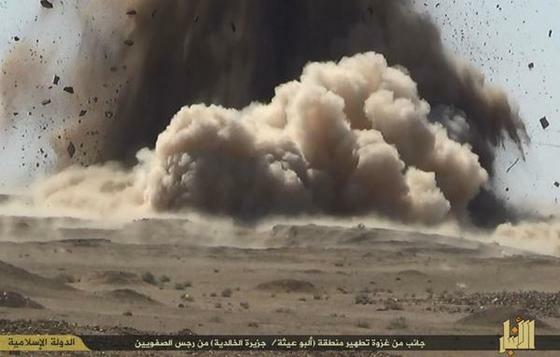 Fighters from the Islamic State in Anbar province ambushed and destroyed a large Iraqi Army column in a village north of Ramadi. The successful attack occurred despite almost eight weeks of airstrikes by the US military on Islamic State forces throughout Iraq. 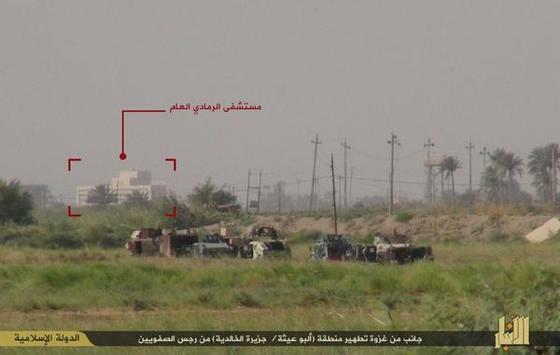 Pictures from the recent fighting in the village of Albu Aytha, which is just north of Ramadi, across the river, have been disseminated on Twitter by fighters and supporters of the Islamic State. The terrorist organization has taken to releasing its propaganda via its supporters on Twitter as the the majority of its official accounts are continuously being suspended by the social media site. While the authenticity of the photographs cannot be confirmed, the captions bear the title of Wilayat (province or state) Anbar. The exact date of the ambush was not provided, but most official pictures are usually published within days of the actual attack. 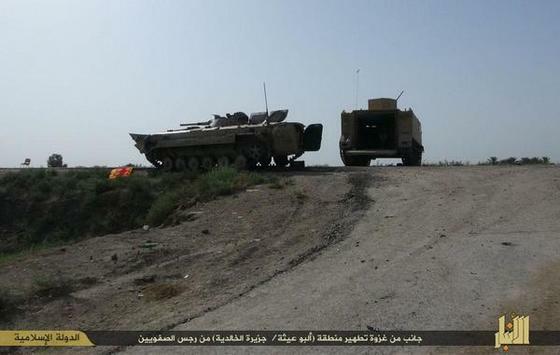 The Islamic State has reportedly been besieging an Iraqi Army unit in Albu Aytha. Al Jazeera reported that more than 240 soldiers from the 30th Mechanized Brigade are “trapped” in the village and running low on supplies and food. Several photos show badly damaged or burned out vehicles, with fighters from the Islamic State inspecting the vehicles or checking for survivors. Pictures also show charred bodies of the Iraqi troops, and the corpses of soldiers who were gunned down during the fighting. 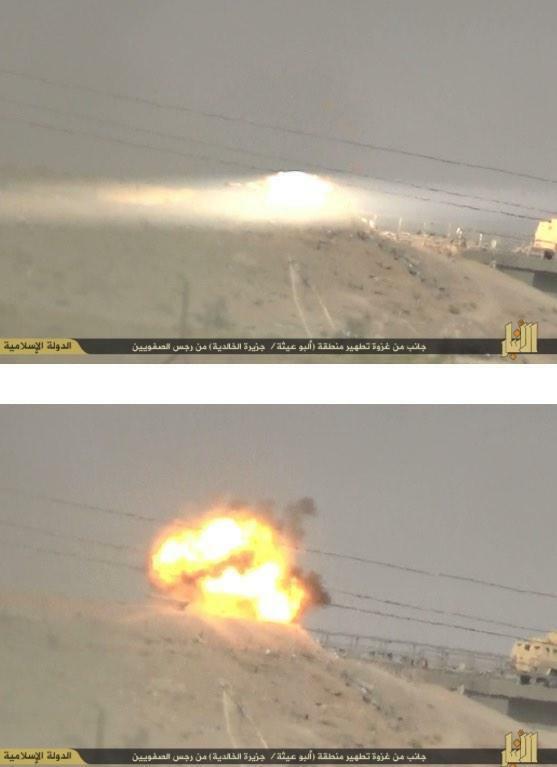 It appears that Islamic State fighters were able to detonate at least two IEDs during the attack. 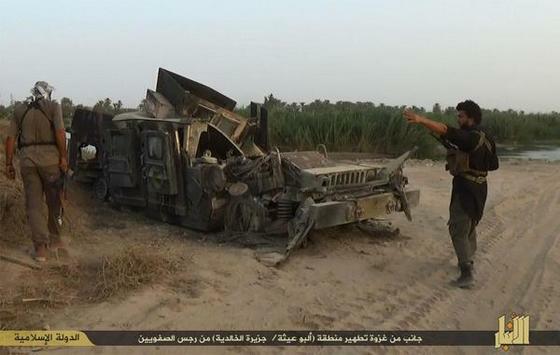 In one picture, at least six captured M113 armored personnel carriers and four Humvees are shown abandoned in a field. Other photos show several damaged or abandoned vehicles. 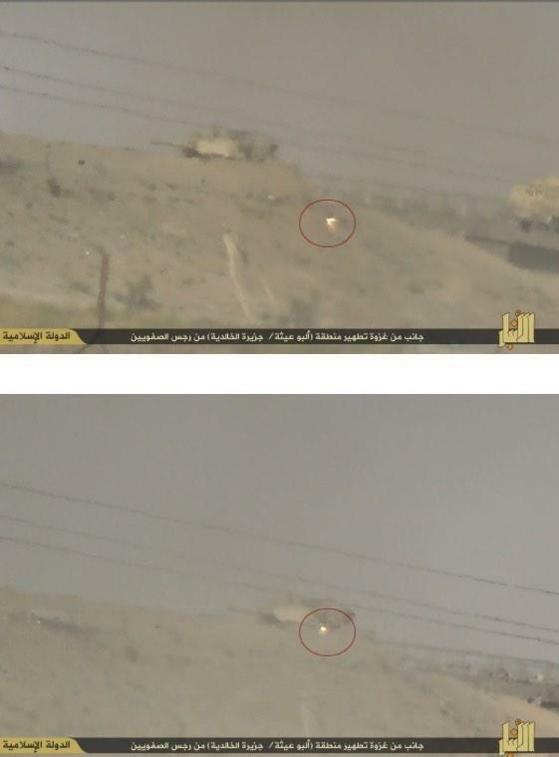 And in another photograph, an Islamic State fighter fires an antitank missile at an M1 Abrams tank and successfully hits the target. 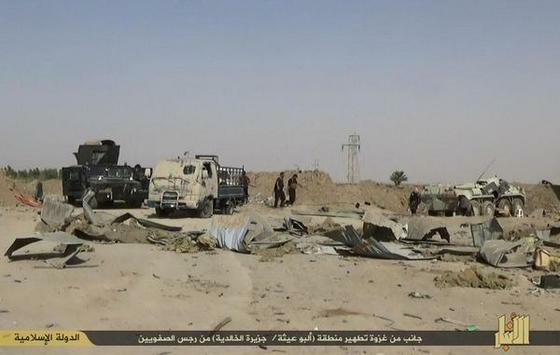 The Islamic State fighters were also able to take over an Iraqi police checkpoint in the area. 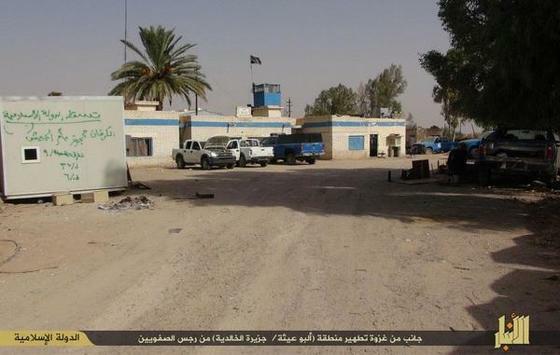 In one photo, the Islamic State’s black flag is shown flying above the checkpoint. Other pictures demonstrate that the group was able to secure a large amount of ammunition and gear from the military. 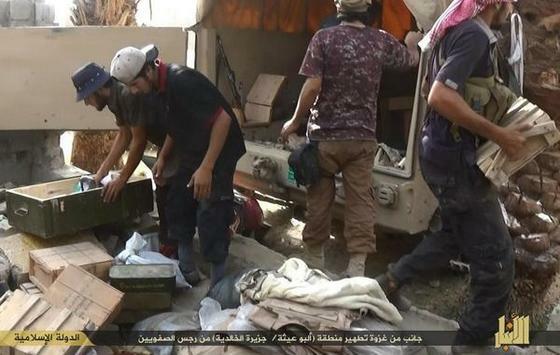 The Islamic State controls most of Anbar province. 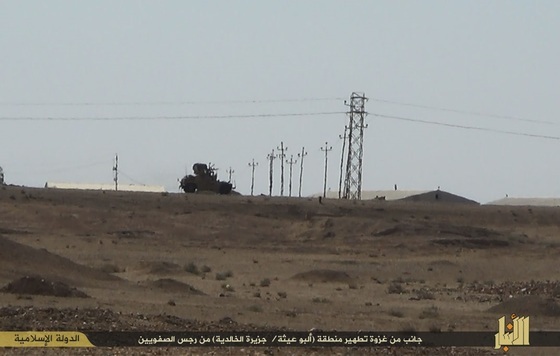 West of Haditha, the Islamic State runs the towns of Anah, Rawa, and the border town of Al Qaim. 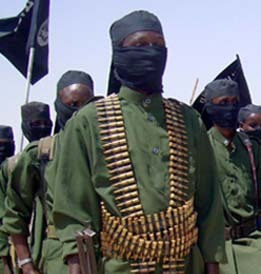 The jihadist group also controls the far-flung towns of Rutbah and Nukhaib. The status of the Tarbil border crossing to Jordan and the Al Walid crossing to Syria is undetermined. Although there are reports that local tribes assumed control of the crossings, the Islamic State has displayed photographs of its fighters at the strategic locations. The Iraqi military previously had two divisions, the 1st and the 7th, deployed in Anbar but most of these forces have withered since the Islamic State took control of Fallujah in January and extended its operations throughout the province. Many Iraqi soldiers are thought to have deserted; the exact number is not known, however. One estimate puts the number of overall desertions for the Iraqi Army at over 90,000. The Iraqi military has not released information on the number of soldiers killed and wounded since the Islamic State launched its offensive in mid-June. 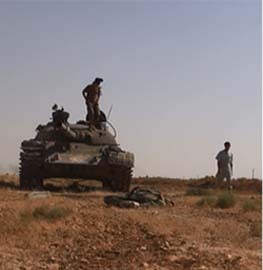 The leadership of the 7th Division crumbled in late December 2013 after an Islamic State suicide team killed the division commander and 17 members of his staff in an ambush in Rutbah. The situation in Ramadi has become so dire that the Iraqi government has deployed 4,000 members of the newly raised militias, who are primarily Shias, to an area that is overwhelmingly Sunni. The militia members were “ferried out to Ramadi from Baghdad by helicopter,” ABC News reported, demonstrating how thoroughly the Islamic State controls the road from Baghdad to Ramadi. The Iraqi military has announced it has successfully cleared areas of Ramadi multiple times since the summer. The Iraqi government has largely halted the Islamic State’s southward advance outside of Samarra, which is just north of Baghdad. Thousands of Iranian-supported Shia militiamen from Asaib al Haq, Hezbollah Brigades, and Muqtada al Sadr’s Peace Brigade are currently deployed between the road from Baghdad to Samarra. Iraqi military and national police units are nowhere to be found on the road, The New York Times reported in July. The US started launching airstrikes against the Islamic State inside Iraq on Aug. 7 and helped Kurdish forces retake some areas lost in northern Ninewa as well as helping a joint Kurdish and Shia militia force retake the town of Amerli. 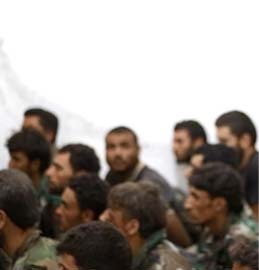 The US supported the Hezbollah Brigades and Asaib al Haq, two Iranian-backed Shia militias that are responsible for killing hundreds of US soldiers from 2006 to 2011, in Amerli. 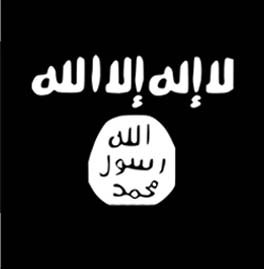 The Islamic State’s territory spans both Iraq and Syria. In Syria, the Islamic State controls Raqqah, much of Deir al Zour, and areas in Aleppo and Hasakah provinces. The US began its air campaign against the Islamic State on Sept. 22, but the jihadist group continues to press an offensive in Kobane near the border with Turkey. From what I’m hearing the IA has elements of 6th, 8th, 9th, and 14th Divisions in Anbar in addition to surviving elements of 7th Div. An excellent article Roggio. How easily folded have the Iraqi troops. Loyal only til tested. Resolute only til fired upon. If not for Iran and US, & Peshmerga, the Iraqi gov’t would have folded by now. No longer seen as legitimate by its citizens. Let the ardent and courageous win the day, whomever they may be. Meanwhile, as we continue to support these “cut-and-run” Iraqi troops (=they have yet to stop running away from battle), we are just giving lip service to those Kurds in Kobane who have held off ISIS for over two weeks. Why is the U.S. in cahoots with the Turks in isolating these Kurds in Kobane? I wonder where they got that anti tank missile? The “Islamic State fighters” in the photo look more like local Sunni tribesman, that is they aren’t wearing the black or camouflage more typically seen in ISIS propaganda videos. I haven’t seen any decent laydown yet of the activities of the Anbar tribes. I’d guess that it will be harder and harder for the Sheiks to support the government as the government increasingly relies upon Shia militia and Iranian paramilitary forces. 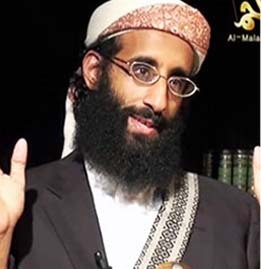 On the the hand, it is likely to the Sheik’s advantage to quietly help ISIS and let ISIS bear the blame and brunt of western counter-strikes. I guess I need to look for some recent IA OOB stuff to see what is really happening there. 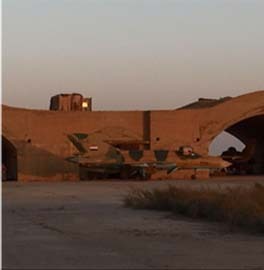 As they incorporate whole Shia militia units into the “Army” and Qods Force increasingly seeks to assume C2, we have a completely different force called the IA today. PUK is the only Peshmerga worth their salt, but they and their PJAK reinforcements are Iranian Puppets and Iran is the only one supplying them. Iran basically emptied its jails of PJAK fighters, handed them their entire stock of M-48s and M-60s tanks from the Shah era and sent them to join PUK. US hates Iran so we aren’t supporting PUK. KDP is useless and keeps breaking and running, hell they fell apart faster than the ISF did once IS went after them. The Iraqi Golden Division had to carry them to the Mosul Dam and PKK/YPG keeps having to shore them up. KDP is a joint US/Turkey Puppet so they get NATO equipment. PKK/YPG, considered terrorists worse than IS by Turkey and for good reason, they killed over 30,000 Turkish Civilians. They are also communists and involved in the drug business. As far as Turkey is concerned, PKK/YPG and IS can kill each other. Why break it up? This is the mess Obama got trolled into stepping into by IS beheadings. Had Obama decided to ignore the provocation and stepped back to let the various factions fight it out, FSA in a Joint operation with JAN would be marching on Raqqah right now. The Airstrikes on JAN which killed the planning team and two Islamic Front Commanders, scuttled that plan and led to a rash of defections to IS from JAN, IF, FSA, and other groups because it was clear despite his denials that Obama had sided with Assad who has committed genocide against his people far worse than anything IS did. Often times the best choice is to do nothing. Now Obama has turned the very people we need to defeat IS into IS camp. Like it or not, we sided with Assad and Iran, regardless of how much we try to deny it. The real war has now begun. If they are using tracked vehicles to attack along roads they are stupid. And stupid gets you killed. Tracks do not need roads out there. Once you secure the objective and the access to it then you can move along the roads. Where was the supporting artiller, mortars, air….? Oh well. It looks to me that these forces would sooner sell all their equipment to ISIS. There seems to be no fighting spirit here. Bad tactics and training as well. Why ride in columns of vehicles when you know that ISIS uses ambush tactics and IED’s and is largely dismounted light infantry??. Why not dismount and start sweeping through suspect areas , using the road as an axis?? Throughout this ambush did not one man have the presence of mind to call for supporting arms?? 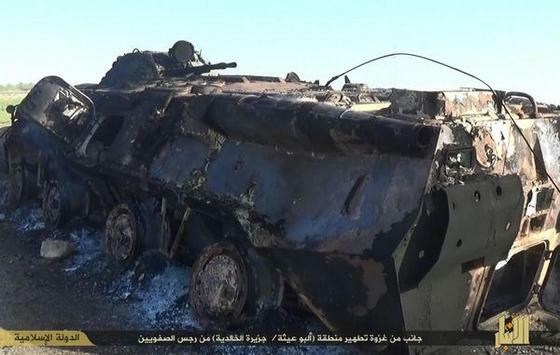 BTR’s ,an M1 tank , BMP’s , M113’s ,Humvees all lost?? Where’s the counter ambush drills?? Were they not trained to do armoured cavalry sweeps using infantry to shield the vehicles whilst the vehicles support the infantry with heavy weapons?? In my opinion it would be far better to deal with Assad and Iran on this issue than any of the pro-Sunni Gulf States. All of them are protecting their own interests here just as you’ve pointed out with the Turks. There’s no backing any moderate opposition in Syria,as far as I can see there is none. The so-called moderate leaders would rather collect the fat hand-outs from the Gulf Donors and live it up in Qatar , Kuwait and Bahrain. Those on the ground in Syria would sooner join IS and Al Nusra , sell all their weapons ,collect the cash from kidnappings , hijackings and the black market then move on. This Syrian war has become one big gore-fest with each group trying to outdo the other in brutality. Is their a single party in this conflict that hasn’t committed atrocities??. We need Assad to stabilise the country,then transfer power to somebody who can retain the army. That somebody needs to be acceptable to all sides in this conflict with the exception of the Islamists. That’s the only way out of this mess , retain the core of the Syrian Army to crush ISIS with Iranian , Russian and US backing. It’s time to start talking to Assad to leave quietly,by using the Iranians as a go-between.